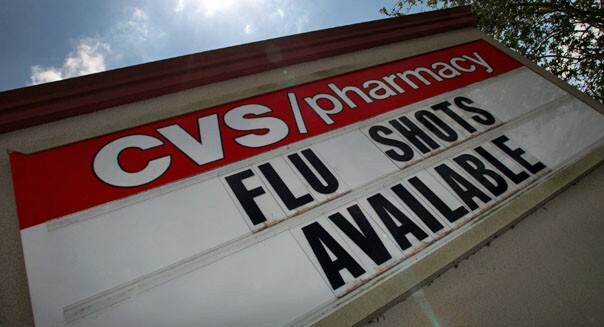 NEW YORK -- CVS posted a higher first-quarter profit on Wednesday as a more severe cold and flu season boosted sales and more new, profitable generic drugs hit the market. Chief Executive Officer Larry Merlo said in a statement that the arrival of new generic drugs, which generate lower revenue but higher profits than branded medicines, was the key factor in the earnings growth. Shares of CVS Caremark Corp. (CVS) were up 0.6 percent at $58.50 in trading before the market opened. CVS said net income rose to $956 million, or 77 cents a share, from $776 million, or 59 cents a share, a year earlier. CVS, which operates a chain of drugstores and has a pharmacy benefits management business, reported a profit of 83 cents a share from continuing operations, excluding special items. That was 4 cents more than what Wall Street was expecting, according to Thomson Reuters I/B/E/S. It was also 3 cents higher than the top of CVS' own forecast range. Still, CVS didn't raise the upper limit of its earlier 2013 earnings forecast from $4 a share. It cited the across-the-board federal spending cuts known as sequestration, which have led to less spending on drugs for the U.S. government's Medicare program for older people. CVS did increase the lower end of the profit outlook to $3.89 a share from $3.86. Wall Street was expecting $3.97 for the full year. Revenue in the pharmacy benefits management unit, which administers drug benefits for employers and health plans and runs a large mail order pharmacy, rose just 0.1 percent to $18.31 billion. But its gross profit margin increased 1.2 percentage points to 4.2 percent of sales. Generic drugs lifted profitability at CVS' retail business, where gross profit was 30.9 percent of sales, up 2.4 points. Revenue in the retail division rose 0.2 percent to $10.05 billion, while same-store sales of general merchandise items were up 1.2 percent. Overall revenue slipped 0.1 percent to $30.76 billion, but exceeded the $30.36 billion that Wall Street expected, according to Thomson Reuters I/B/E/S. Whether you rent or buy, it's best to keep your housing costs at a maximum of 31 percent. A. Close old credit card accounts you no longer use. B. Pay down your debt to at least 25 percent or less of each credit card limit. C. Consolidate your debt on one balance-transfer credit card. Canceling a credit card account could cause your credit score to decline because it lowers the overall available credit you have been granted. And while a balance transfer may help you pay your debt faster, watch out: Your credit score could go down if the money you transfer maxes out that single credit card. B. Only when you've been turned down for a loan or credit card. C. Three times per year. If you are denied credit based on something in your credit history file, you are eligible for a free credit report from the reporting bureau used. However, regardless of your credit activity, you can get one free credit report each year from EACH of the three credit reporting agencies (Experian, TransUnion and Equifax). You ca access your free credit report at www.annualcreditreport.com. While the amount varies according to your living costs, your other assets, and whether you are a one- or two-income household, a good starting place for emergency savings is having enough to cover six months of living expenses. Life insurance is essential for someone who is the sole income provider for a family. So, while the others may want life insurance to provide for family members, the single mother needs the most protection for her children in the case of her death. Credit reports do not take into account your income. A. Jane, who makes the minimum payment on her credit card bill every month. B. Joe, who pays the balance on his credit card in full every month. C. Joyce, who sometimes pays the minimum, sometimes pays less than the minimum, and missed one payment on her credit card bill. Skipping a payment -- or paying less than the minimum amount due -- is likely to cause your credit card company to raise your interest rate. Paying only the minimum will also result in paying large amounts of interest over time. A. Pay your bills on time. B. Hire a credit repair company. C. Cancel your credit cards. Cancelling your credit cards won't help because the balance owed and your payment history will stay on your credit report. A credit repair service cannot fix accurate negative information. Only time -- and a consistent ongoing payment record -- can fade the impact of negative information. In general, most CDs limit your withdrawals to the end of the CD term; money market accounts allow only six withdrawals per month; and you can get money from a checking account as many times as you want. However, rules can vary from institution to institution. So know the terms on your account to avoid getting socked with a surprise fee. A. Tom saves $1,000 per year from age 25 to 35 in an account earning 8 percent interest and then stops saving. B. Tracy saves $1,000 per year from age 35 to 65 in an account earning 8 percent interest. Surprise! Even though Tom invested only $10,000 and Tracy saved $30,000, Tom comes out ahead in this savings scenario with $169,000 in his account compared to Tracy's $125,000. That's because Tom's money had a longer time to grow. That's the miracle of compound interest in action.